Given its significance, the Monday night preview of Toyota's new Avensis was a remarkably low-key affair. A few dozen journalists and company executives witnessed the car's unveiling at the event at the Pavillon Gabriel in Paris. Tadashi Arashima, president and chief executive of Toyota Motor Europe, started out by bemoaning the "current business situation". 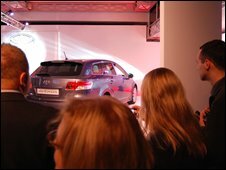 By the time he got around to talk about the Avensis - a model that is not only designed for and built by Europeans but also kick-starts a frantic launch period as Toyota aims to bring 18 new models to market by the end of 2009 – any celebratory mood had been replaced by earnest concern. However, Toyota's new models will include a few attention-grabbing cars. These include the next generation Prius, which will have its global premiere at the Detroit motor show in January, and Paris premieres of the iQ mini-car and the Urban Cruiser. "We have a lot of new products that are meeting the current market conditions," said Mr Arashima, pointing to how cars developed to meet stricter emission regulations in Europe are also delivering the fuel economy currently demanded by frugal consumers. So does this mean the Japanese carmaker is set to take advantage of the economic downturn by boosting its market share in Europe? 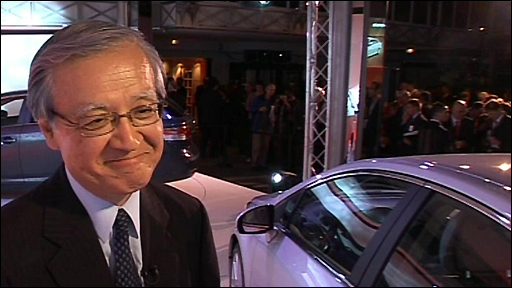 When BBC News posed the question during a pre-launch briefing, Mr Arashima responded with a modest smile. "Maybe by accident," he said. "We didn't really expect the market to go down so quickly." In Toyota's case, sales have slipped 15% so far this year in Western Europe, though a 25% rise in sales in Russia helped to compensate for the slump. Nevertheless, its European market share has shrunk to 5.3% during the year to date, down from 5.6% a year ago. 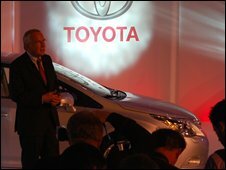 Mr Arashima acknowledges that in 2008 it will be "tricky" to match the sales seen in 2007, when Toyota hit its 11th consecutive sales record in Europe. However, he insists the tables will turn come the New Year. "I am fully convinced there is no better time for our new line-up to hit Europe," Mr Arashima said. "We expect to grow our market share month by month in 2009." Globally, Toyota hopes to add 200,000 sales to its books during 2009, to 9.7 million cars and other vehicles. That would be no mean feat at a time when pretty much all its rivals are cutting back. In Western Europe, total car sales by the industry as a whole are set to fall 10% in 2009, according to Toyota's own internal forecast. "Western Europe is definitely going to go down," Thierry Dombreval, executive vice president and chief operating officer of Toyota Motor Europe, told journalists during a briefing. "Spain is now down 32% in September, and the UK is very fragile." In Russia, Europe's fastest-growing market, growth is set to slow to 5% next year, from some 25-30% growth so far this year, Mr Dombreval added. This latest prediction is much lower than Toyota's previous forecast of 15% sales growth in the Russian car market during 2009. Toyota's optimism is not limited to its growth in market share in 2009. Over time, regardless of whether or not the current economic downturn is lengthy or not, the company predicts that global demand for cars will grow fast. "Cars are indispensable anywhere in the world for people to move, and the current financial situation does not change that," said Mitsuo Kinoshita, executive vice president, Toyota.